Sometimes, when life throws too many challenges all at once, and this has been one such week, I think how perfect and peaceful it would be if I lived on an island with a small colony of like-minded people. 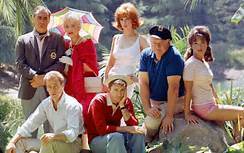 It started in my childhood, of course, and probably down to the TV series ‘Gilligan’s Island’, an American comedy in the 1960s. A group of people had gone on a short boat trip which somehow drifted off-course into a storm and they got shipwrecked on to an island. I loved it. They built shelters, made use of whatever they salvaged from the vessel and became self-sufficient. They constantly missed out on opportunities to be rescued. Any humour in there went right over my young head. I just wanted to sleep in a home-made hammock under a canopy of intertwined leafy branches, eat their food and drink out of coconut shells. Around this time I saw ‘The Blue Lagoon’, the original 1949 film, and it had the same appeal. Shipwrecked on to a South Pacific desert island with everything they needed to survive, the main characters were two children, a boy and a girl, and a sailor who drank himself to death. The children grew up and had a child of their own before eventually leaving the island. I failed to enjoy the 1980s remake. ‘Rebecca’ by Daphne du Maurier is a favourite book read over and over again and the film seen many times. The first time I read the book I was stunned by the revelations that followed the shipwreck and couldn’t read it fast enough, I was so eager to find out if everything would be alright in the end. 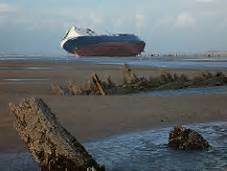 Famous Fylde Coast shipwrecks include the MS Riverdance which ran aground in 2008. It was not possible to refloat her and she was broken up on the shore, not far from the remains of the Abana. The Abana is visible at very low tide. 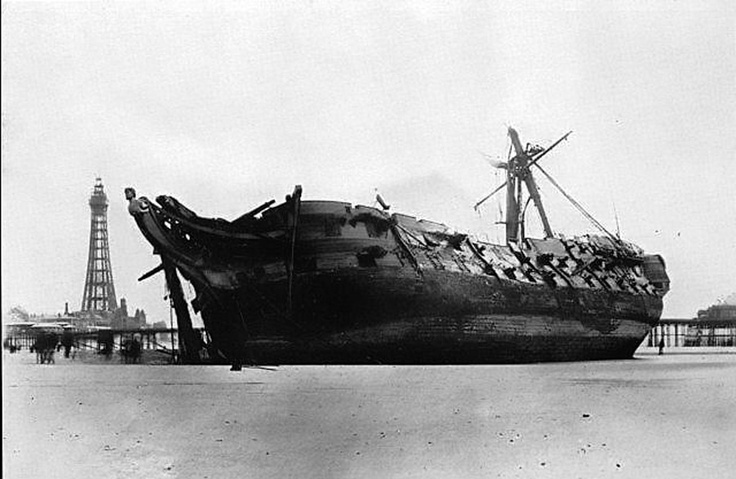 And Nelson’s HMS Foudroyant. I found this poem, previously unknown to me. (1859 - 1930/Male/English) For Christo, who would have been on my A list for my island colony. It was always a pleasure to be in his company or have a Facebook chat. A fine gentleman who will be much missed. God bless you. Very interesting Pam. The HMS Foudroyant poem is new to me too. Not having had a TV when I was a kid, the likes of Moonfleet and Robinson Crusoe (plus the film Swiss Family Robinson) were what fired my castaway imagination.